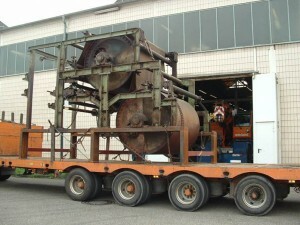 This paper machine was measured a few times before being transported. If you want to hear museum people moan, just say “measuring”. Everybody has a story about it. Murphy of Murphy’s Law seems to linger around our tape measures, folding rules and distance meters. Not all stories are as extreme as the story shown in the pictures. The paper machine was measured again and again because it was obvious it was the most difficult thing to move in the great storage relocation. We had a technical documentation. 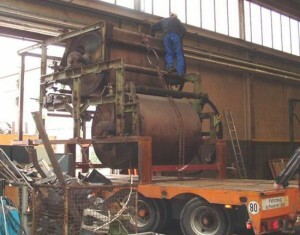 We had specialists in heavy loads for this, experienced in much more problematic cases than our “little” paper machine. We had confidence in our abilities as professionals when we supervised this part of the machine being craned on the low-bed trailer. It was not until then we realized the machine didn’t fit through the gate when standing on the low-bed trailer. It wasn’t much, maybe a few inches. It seemed that the inaccurancies in measurements (height of the machine part, height of the trailer, height of the gate) just added up to the worst case. There was no denying – we had a problem. Fortunately, we had experienced heavy load riggers. After a few discussions we decided to crane the machine on wheel boards and push it carefully through the gate. It worked. 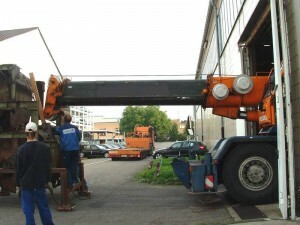 After passing the gate the paper machine was craned back on the low-bed trailer and moved to its new home. Don’t let your eyes fool you: Now it seems obvious that it doesn’t fit through the gate, but that’s only due to perspective. In reality it were only about 4 cm missing.